Description Carepacks is a weekend food program aimed at preventing hunger among Talbot County's most economically vulnerable students. We serve students at ALL Talbot County elementary schools. Description Provides nutrition and gardening education to community groups in coordination with the Talbot County Hunger Coalition. Description As one of the earliest settled areas of the United States, the Delmarva Peninsula - including Talbot County and the town of Easton - has a long and proud history of self-sustainment. The rich farmland and extensive waterways have sustained our economy and provided a way of life for generations of Eastern Shore residents. In addition, modern consumers are showing an increasing demand for more locally grown, farm to table food goods. Description The Supplemental Nutrition Assistance Program (SNAP), called the Food Supplement Program (FSP) in Maryland, formerly known as Food Stamps, helps low-income households buy the food they need for good health. Everyone has the right to apply for FSP. Applicants must file an application, be interviewed, and meet all financial and technical eligibility factors prior to issuance of FSP benefits. Some people who have little or no money may qualify for Expedited Food Supplement benefits right away. They must have only an interview and verify identity. Visit: http://dhr.maryland.gov/food-supplement-program/ for more information on income guidelines and/or to apply online. Description University of Maryland Extension’s Growing Healthy Habits is a gardening and nutrition education curriculum used in classrooms, after-school clubs, and summer programs for youth. The Growing Healthy Habits program uses growing food to teach about the link between nutrition and gardening. Description Located at the Easton Bowl parking lot selling fresh produce everyday. Description Our mission is to be a resource united in providing food to families in their time of need. The food pantry through Harvest Of Hope serves families within the Talbot, Caroline, Dorchester, and Queen Anne counties. Senior Citizen Meals are delivered on Mondays and Tuesdays - to sign up for meal delivery, please email kathytaylor@eastoncog.org. Description To help combat the increasing problem of hunger in the community, this group of nine local faith congregations decided to expand on the winter Wednesday soup kitchen that was already running at Asbury United Methodist Church. We began making and delivering lunches throughout the year to people in Easton. During four winter months, Asbury provides soup and bread, with other congregations helping with desserts and fruit. On the rest of the year, each congregation acts independently on the assigned week and members of Asbury participate weekly with each group. Approximately 95-100 people, who are referred by the county Health Department and faith groups, receive lunches every Wednesday. Description The Maryland Food Bank – Eastern Shore Branch distributes food to eight counties: Caroline, Dorchester, Kent, Queen Anne’s, Somerset, Talbot, Wicomico, and Worcester. In December 1980, the Maryland Food Bank opened a branch in Salisbury in order to better serve the rural populations of the Eastern Shore. In its first year, the branch distributed about 33,000 meals. In FY 2016, the branch distributed more than 4.9 million meals to food-insecure Marylanders. Since its launch, the Maryland Food Bank – Eastern Shore Branch has grown its distribution significantly. In the last few years, the branch has expanded the Maryland Food Bank’s School Pantry Program, which distributes food to children and families in need throughout the school year to 18 pantries. The Maryland Food Bank – Eastern Shore Branch currently provides food to more than 252 distribution and community-based partners in the region. Description Meals on Wheels is a national non-profit volunteer community service providing nutritional home-delivered meals, at cost, to qualified home bound seniors 60 years of age or older. Meals are also provided to disabled individuals unable to prepare or obtain adequate meals. All meals are offered at a nominal cost during a period of need. This service is offered to qualified persons (disabled and seniors) who may benefit from it, regardless of income. Meals are prepared and packaged at cost and delivered by volunteers three days a week: on Mondays, Wednesdays, and Fridays to the individual’s home. For more information about the program, to sign-up for meal delivery to your home, or to volunteer, please call the Center at 410.822.2869. Description Mom’s Meals is a leading national provider of fresh-made, home-delivered meals and nutrition services for individuals desiring convenience or independent living and for patients recuperating at home or managing a chronic disease. Description Moveable Feast provides food to low income residents suffering from life-threatening diseases like AIDS, diabetes and cancer. Since 1989, Moveable Feast has delivered 12.3 million healthy meals at no cost to more than 14,600 sick and poor people in Maryland counties. Description Distributes food through Emergency Food Pantry; provides meeting space for Alanon, Mental Health, Stroke and other support programs; Worship Services are at 10:00 every Sunday morning - Childrens’ Sunday School and Nursery are available during the service. Description Everyone is Welcome! Call for more information. Description Food Assistance: We offer food & paper supplies to residents at St. Mark's Village and food to individuals who contact the church. Description The St. Michaels Community Center is now a Food Distribution site, helping the St. Vincent de Paul Society expand its reach for the Maryland Food Bank. To receive food donations from the Maryland Food Bank, please feel free to stop by our Railroad Ave. location anytime between 1 - 3 p.m. on Mondays and Wednesdays. Holiday Dinners are open to the public at Thanksgiving, Christmas and Easter. A great opportunity to break bread with neighbors and friends. There's no charge and anyone is welcome. Dates and times will be posted on our Calendar of Events. To donate food for distribution or holiday dinners, or to volunteer to work the dinners, please call Trish at 410-745-6073. Non-perishable food is also available on a limited basis for anyone in need. Call Trish at 410-829-3883 if food is needed outside of office hours. Non-perishables may be dropped off at anytime. Fresh food for holiday dinners may be dropped off the day before scheduled dinners. Description The St. Michaels Farmers Market brings fresh food to the center of town on a weekly basis to improve food access and equity to the Bay Hundred area. All vendors are able to accept cash in addition to credit, debit and SNAP/EBT cards. Some vendors also accept WIC FMNP and FVC vouchers. The Farmers Market also matches SNAP or WIC purchases up to $5 each week! Finally, the market is a 2018 summer meals site, providing a free breakfast to all children and youth under the age of 18. Description Non-perishable foods; frozen meat, fresh produce, storybooks for children good cheer and other area resources for family assistance. 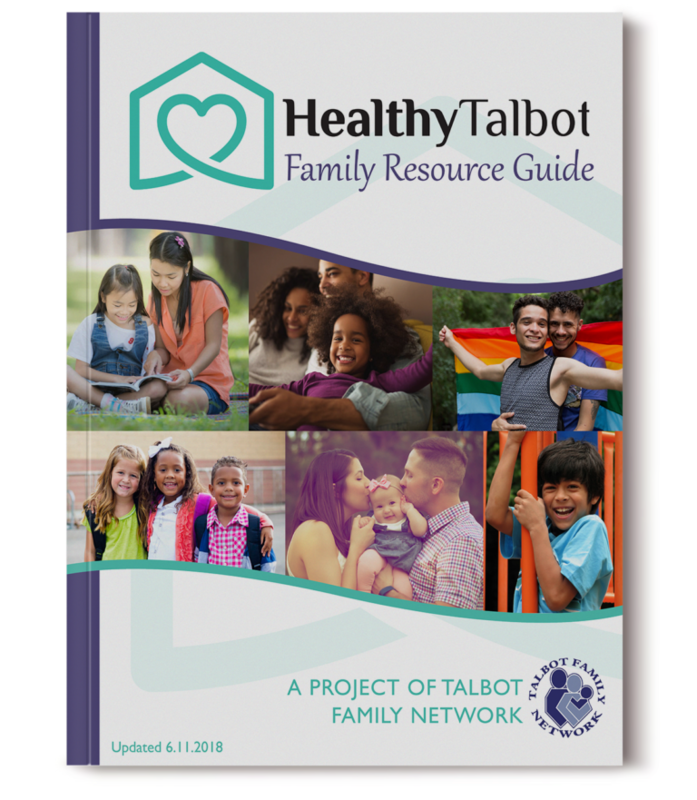 Description The Talbot County Hunger Coalition is a network of community members, providers and caring individuals working together with the Talbot Family Network to end hunger and improve access to healthy, nutritious food for our most vulnerable residents. Description Food pantry for those in need. Description Serving Caroline, Talbot, and Dorchester Counties - WIC is a nutrition and supplemental food program for Women, Infants, and Children. To be eligible a woman has to be pregnant, breastfeeding an infant under one year, or has to have delivered within the past 6 months. Infants are eligible from birth to one year of age, and children are eligible from one year to 5 years of age, as long as, they are also income eligible, live in the service area and are considered to be a nutritional risk as determined by the program guidelines.